The Empire Farmstead Brewery in Cazenovia has established itself as the largest farm brewery on the eastern seaboard. And a spate of new state laws, friendly to brewers, has made it possible. It used to be that Madison County was a leading producer of hops, an ingredient in beer. Then along came Prohibition, which almost killed the brewing industry -- and the ancillary industries that supported it -- and created a series of laws unfriendly to brewers. Now, almost 100 years later, beer is again big business in New York state. Craft breweries in particular have a $4 billion economic impact. One of the leaders has been Empire Brewery in Syracuse. And now owner David Katleski has taken his business to the next level, building Empire Farmstead Brewery in Cazenovia. The brewhouse produces beer, and grows hops and other ingredients, for use in the brewing process. He says he couldn’t have done it without New York state, which he says has gone out of it’s way to eliminate those Prohibition-era regulations, and offer economic development money. "Honestly, we became experts at writing grants, because there is so much money that's out that that’s not even being used, that we tapped into. So we wanted to look at all the aspects of that, so we wouldn’t have to give up any equity,” said Katleski. Lt. Gov. Kathy Hochul travels the state on economic development business. She says she finds the brewery boom, along with growth in wineries and craft distilleries, as a sign the investment and rewiring of state laws, was worth it. 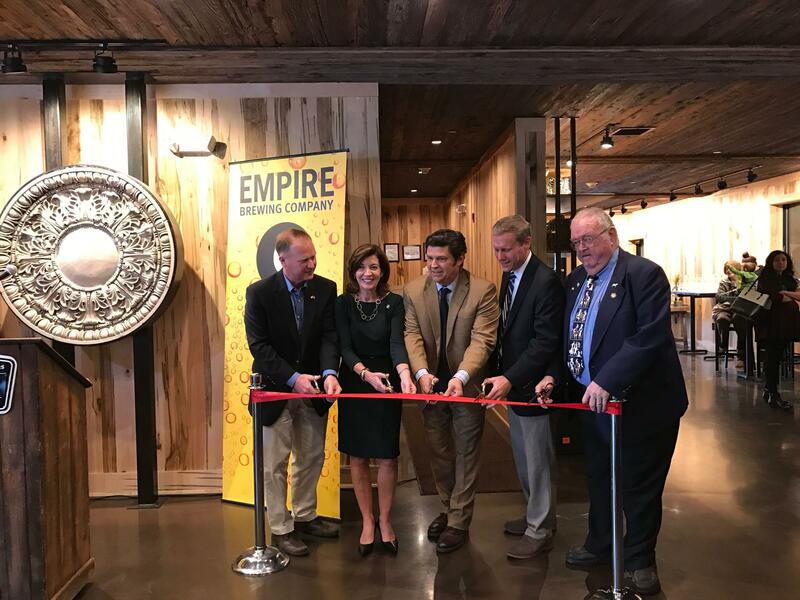 Syracuse's Empire Brewing Company will become one of the top five brewers in New York state, if all goes well with the creation of Farmstead Brewery in Cazenovia. Empire wants everybody to get in on the craft brew party, even people who aren’t craft beer connoisseurs. The owner of the Empire Brewing Company says he wants to turn more people into beer snobs. "The longer they are surrounded by craft beer, the more they’ll let their barriers down and try new things," says Empire founder David Katleski. There’s good news for barley farmers in central New York and other parts of the state. The federal government will begin offering crop insurance for the grain that is an essential ingredient for brewing beer. At a small brewpub in North Syracuse today, Sen. Kirsten Gillibrand (D-NY) said this new insurance fills an important hole.